Arsenal are ready to reward youngster Alex Iwobi with a new contract after his recent breakthrough into the first team, according to the London Evening Standard. The 19-year-old scored his first Premier League goal in Saturday’s 2-0 win over Everton and made his full Champions League debut in Barcelona earlier in the week. And the London Evening Standard reports that Arsene Wenger is eager to ensure that Iwobi gets an improved deal after making an impact on an out-of-form side. 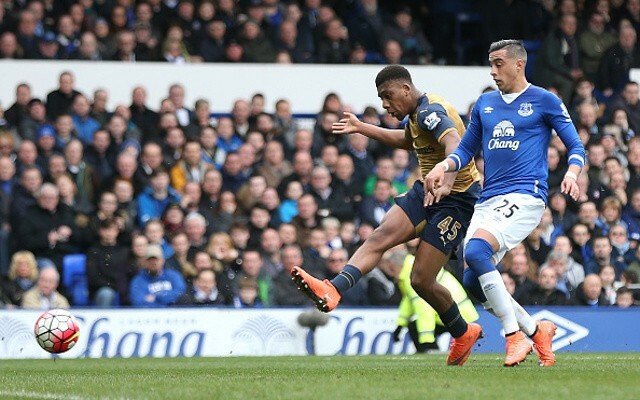 The London Evening Standard adds that Iwobi could get a pay rise to £10,000 per week, from the £1,000-per-week contract that he signed only last October. That is an awful lot of money for somebody who has made a single Premier League start, but Wenger obviously sees potential in the Nigerian-born academy graduate. He has entrusted him in big matches of late while Joel Campbell and Theo Walcott have sat on the bench, and is likely to continue to use him after his impressive displays.